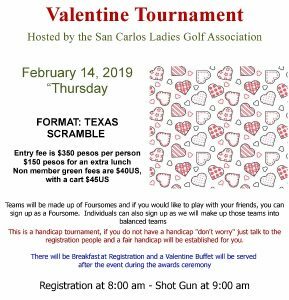 Sign up now for the Valentine’s Golf Tournament on Thursday, February 14, 2019. Registration at 8:00am and Shot Gun start at 9:00am. The Tournament is open to women and men, members and non-members. Each year this tournament proves to be a favorite golf tournament. It is a challenge of patience, endurance and a test of true love! The format is a Texas Scramble. Each player tees off. Pick the Best drive. You may not follow your shot. After all shots are on the green, all 4 players may putt until the ball is holed. 3 Drives per player. No Gimmies! 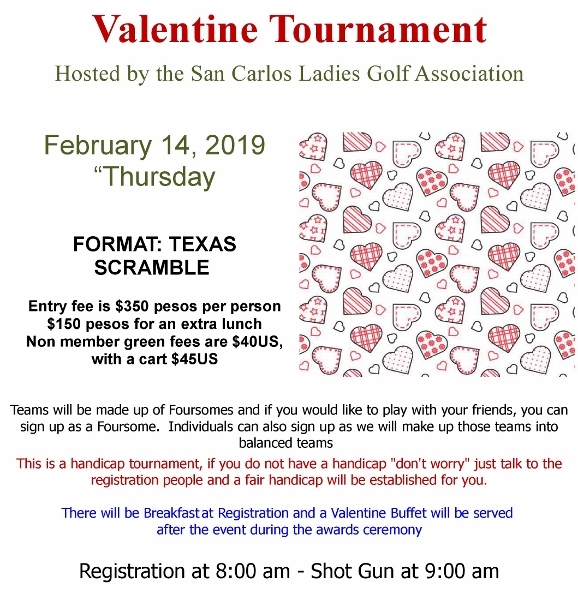 The cost is 350 pesos per person (plus green fees if you aren’t a Golf Course Member). 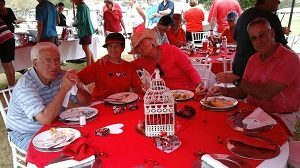 Breakfast is included and a Valentines Buffet following play. Non-Players can join in the Buffet for only 150 pesos. This Tournament fills up fast so sign-up now at sancarlosmensclub.com and in the Pro Shop at the Country Club. Please include handicap if you are not on the Ladies or Men’s Club. You will be paired in foursomes.